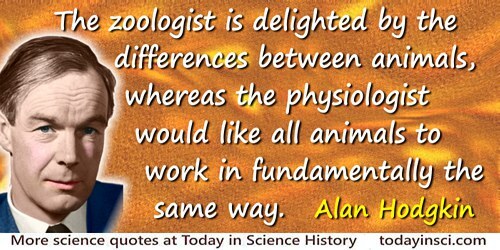 English physiologist and biophysicist who shared the Nobel Prize for Physiology or Medicine in 1963, for the discovery of the chemical processes involved in nerve conduction. I think that Alfred Nobel would have been pleased that his prize emphasizes the continuity of science, as well as its novelties. From Speech (10 Dec 1963) at the Nobel Banquet in Stockholm, Sweden. Collected inGöran Liljestrand (ed. ), Les Prix Nobel en 1963, (1964). In neurophysiology we have none of those vast tidal waves of discovery which shake the world to its foundations and which have such incalculable consequences for good or evil. Nervous messages are invariably associated with an electrical change known as the action potential. This potential is generally believed to arise at a membrane which is situated between the axoplasm and the external medium. If this theory is correct, it should be possible to record the action potential between an electrode inside a nerve fibre and the conducting fluid outside it. Most nerve fibres are too small for this to be tested directly, but we have recently succeeded in inserting micro-electrodes into the giant axons of squids (Loligo forbesi). 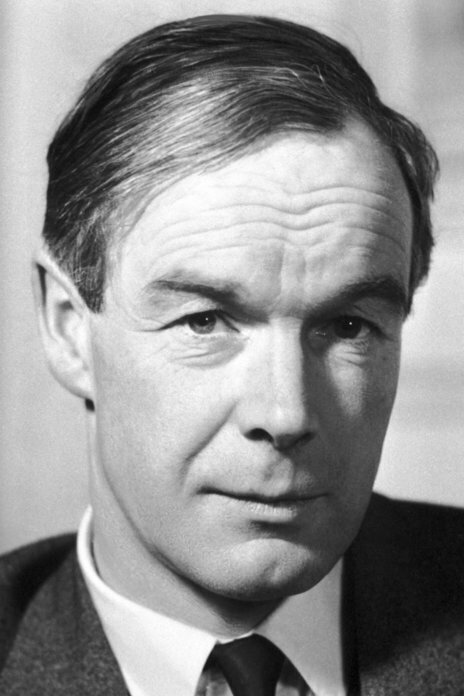 Co-author with Andrew Aelding Huxley, British physiologist, (1917-2012), in 'Action Potentials Recorded from Inside a Nerve Fibre', Nature (1939), 144, 710. One of the many useful properties of giant nerve fibres is that samples of protoplasm or axoplasm as it is usually called can be obtained by squeezing out the contents from a cut end … As in many other cells there is a high concentration of potassium ions and relatively low concentration of sodium and chloride ions. This is the reverse of the situation in the animals’ blood or in sea water, where sodium and chloride are the dominant ions and potassium is relatively dilute. The Conduction of the Nervous Impulse (1964), 27. 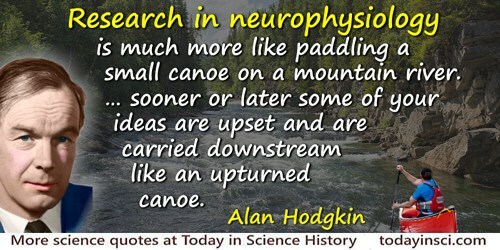 Research in neurophysiology is much more like paddling a small canoe on a mountain river. The river which is fed by many distant springs carries you along all right though often in a peculiar direction. You have to paddle quite hard to keep afloat. And sooner or later some of your ideas are upset and are carried downstream like an upturned canoe. Some one once asked Rutherford how it was that he always managed to keep on the crest of the wave. “Well” said Rutherford “that isn’t difficult. I made the wave, why shouldn’t I be at the top of it.” I hasten to say that my own subject is a very minor ripple compared to Rutherford’s. [William Rushton was] a man with great personal magnetism and considerable charm… [although] There were those who misjudged all of this as arrogance. In obituary, 'Some Recollections of William Rushton and his Contributions to Neurophysiology', Vision Research (1982), 22, 614. 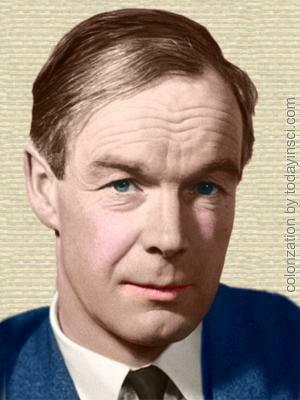 5 Feb - short biography, births, deaths and events on date of Hodgkin's birth. Chance and Design: Reminiscences of Science in Peace and War, by Alan Hodgkin. - book suggestion.